CARTE POSTALE & FRENCH FLAIR doing double duty! I recently participated in two Winter Mini Catalog Swaps and quite by accident, discovered how to make two sets of swaps simultaneously if you are using the tearing technique! I tore the cardstock on the vertical diagonal for my first card and didn't want to waste the other piece, so I created a similar card IN REVERSE using the other torn piece-ending up with a Valentine and a Birthday card! The same products are used in both cards with the exception of a saying set-I used All Year Cheer III for the Valentine card and Elegant Greetings for the Birthday card...so now I have 2 cards for 2 friends-for two separate occasions! 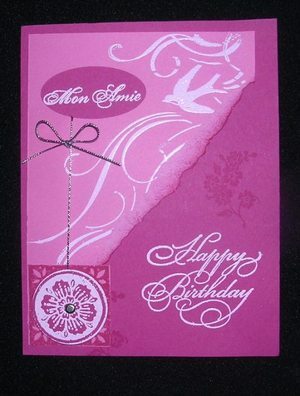 First I stamped the French Flair background with Versamark ink on the Rose Red and embossed with Pink EP. 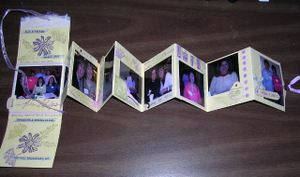 I then tore that on the diagonal, sponged the edges and attached to the Regal Rose foldover cardstock. 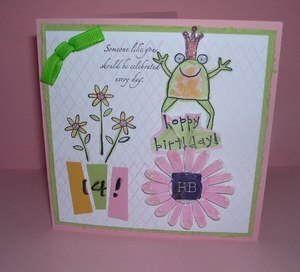 I stamped the main cardstock with the floral stamp, then embossed the birthday/valentine saying. Next, I stamped the square design with Regal ink on Rose cardstock and used square punch. Do the same with the circle design but EMBOSS with lt pink ep. Use the 1/16" punch in the center and insert the brad. Punch the top of the square punch out and insert the silver cord BEFORE attaching the circle to the square with dimensionals. I made the B-day card first, so I punched straight up from the bottom corner for my oval opening and the used the punched out oval on the Valentine card. On the birthday card,the cord is wrapped around the rose cardstock and adhered to the back, then I made tied a separate piece around it for the bow, before attaching to the main card, and stamping the Mon Amie saying. 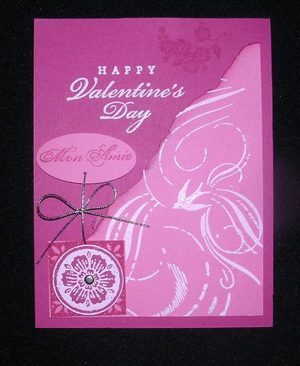 For the Valentine card, I stamped Mon Amie on the oval cardstock, then made a hole using the 1/16" punch before pulling the cord thru and attaching. The oval is raised and attached with Dimensionals. It sounds much more complicated than it is! 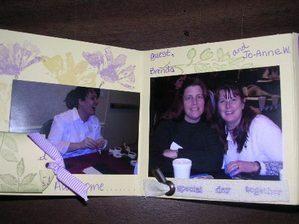 This is a terrific way to use those extra torn pieces of cardstock and saves you time if you create both cards at the same time! Happy Stampin'! 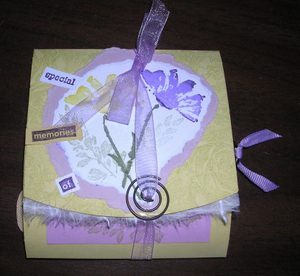 I love to use Unfrogettable and Looks Like Spring sets together..I used the Cutter Kit to distress the edges of Celery cardstock. After cutting out the flower, I rubbed the edges across the Versamark Pad, dipped into Heat and Stick powder (which becomes a wet glue when heated), heat with the Heat Tool, then dipped the edges into Dazzling Diamonds Glitter-once more with the heat tool to set the glitter, then stamped the HB in center and attached a Clear Button in the center with Crystal Effects. 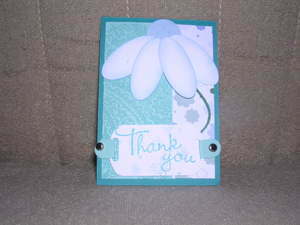 The flower is attached to the card with a Dimensional (a sticky two-sided foam dot) to raise it and give it depth. 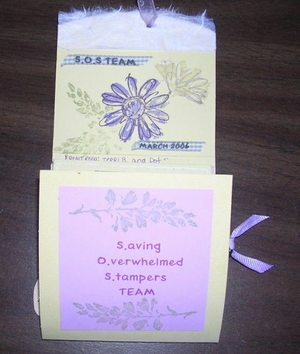 The colored cardstock pieces under the trio flowers was done with the Paper Piecing Punch. It's hard to tell in the photo (click on the picture to view larger) but the Hoppy Birthday was actually scored with two mountain folds and one valley fold to give the faux effect of being popped open when the frog leaps up. The bow is actually a cheater's bow with the ends tucked back in. Crystal effects was applied to the frog's eyes and centers of the flowers. It was a fun card to make and of course it was a hit with our daughter Kelley! I thought the French Flair background stamp from the Winter Mini Catalog and Organdy Ribbon would add elegance to the otherwise whimsical ATC and switched to the Small Oval Punch for the saying and changed from Bold Brights Brads instead of silver. 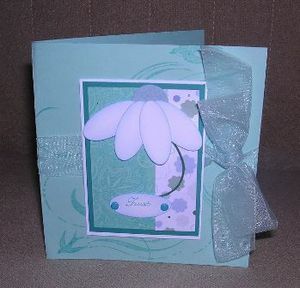 A simple adaptation converted this cutesy ATC into a lovely card! Inside I used a saying from Elegant Inspirations which says: "Be joyful in hope, patient in affliction, faithful in prayer" Romans 12:12. My friend LOVED it! More importantly, it lifted her spirits and she said she will refer to it over and over again whenever she feels the stress taking over...that's just what I wanted to hear!